The NFL announced this week that they would suspend players for flagrant hits to the head of an opponent in an effort to crack down on such violence. They took their first step towards policing the hits by levying heavy fines against various offenders. As I heard people go off on the subject since it became the top talking point of the week, I said this was mostly a P.R. move by the NFL looking to quell the outcry. It’s not that they want don’t want to protect players, it’s that they understand hard hits are a brutal consequence of having a violent game. Plus, let’s be real — we love big hits, and the league profits off of them. “It’s freaking football. There are going to be big hits,” Urlacher said. “I don’t understand how they can do this after one weekend of hitting. And I can’t understand how they can suspend us for it. I think it’s a bunch of bull (crap). “I tell you this: I won’t think twice about hitting someone,” he said. “I don’t think a lot of guys will. It’s football. If you think twice, you miss tackles. You can’t second-guess. We’re taught to play one way, and that’s fast. Amen amen amen amen. If Brian Urlacher were here, I would kiss him. (on the cheek). These moves are completely reactionary and aimed at appeasing the screaming heads on TV. You can’t make a defensive player think twice about doing his job otherwise all the analysts will be ranting about the missed tackles on Sundays. The game has already skewed completely towards offenses. Why even have tackling if you don’t want the defense to have a shot at stopping opposing offenses? 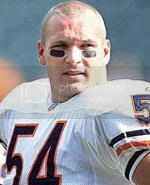 I sure am glad Urlacher spoke up and that other players have as well. Even former Georgia star David Pollack, whose career ended with a bad hit, says these rules are bull.